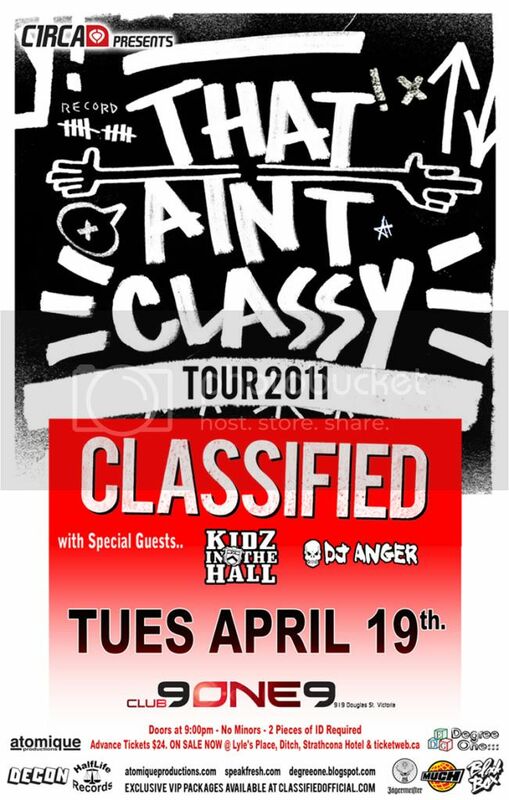 Degree One Events: Classified's 'That Ain't Classy Tour'. Classified's 'That Ain't Classy Tour'. w special Guests Kidz In The Hall & DJ Anger. Doors at 9pm - 19+ w/ 2 Pieces of ID. On March 24th, 2011 Luke Boyd, aka Classified, is set to embark on a national 22 date tour in support of his major label release Hand Shakes and Middle Fingers (Sony Music Entertainment Canada Inc.), in stores March 22nd, 2011. Two years after Classified electrified fans with his major label debut, Self Explanatory, featuring singles "Trouble", "Anybody Listening" and the platinum selling single and unofficial 2010 Olympic anthem "Oh, Canada", Classified is back with his 12th studio release Hand Shakes and Middle Fingers. The album's first single "That Ain't Classy" hits the web Monday January 31st (http://www.classifiedofficial.com/ ), Canadian radio on February 7th and is available for download on iTunes February 8th. Hand Shakes and Middle Fingers features 15 "Classy" new tracks focusing on themes of balance, addressing the ups and downs of the continuing changes in one's life. From his first LP Union Dues in 2001, to the JUNO Nominated BOY COTT-IN THE INDUSTRY (2006), HITCH HIKIN' MUSIC (2007) and MuchMusic Video Award winner/JUNO Award nominated Self-Explanatory (2009), Classified has sold well over 65,000 records in Canada alone, and has continuously toured the country coast to coast. The upcoming Canadian tour is presented by MuchMusic, which has championed Classified's music for years, and the video for the single "That Ain't Classy" (Directed by HARV) will hit MuchMusic's rotation on February 15th. Classified will perform in cities large and small with a massive performance at the Sound Academy in Toronto on March 26th. Be sure to catch Classified's electrifying live show featuring joints from Hand Shakes and Middle Fingers coming to a city near you! Click here to RSVP and Invite your Friends on the Facebook Event Page.